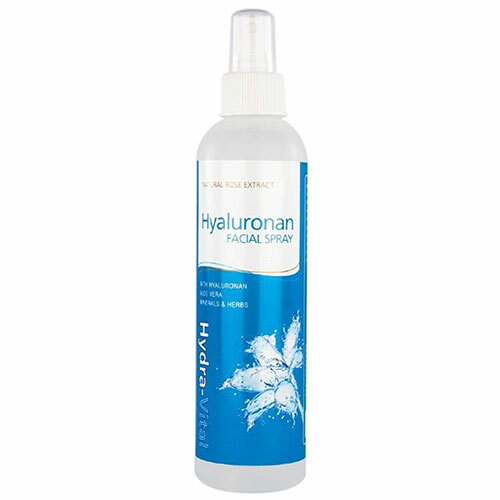 Hydra-Vital Facial Spray hydrates & freshens your skin to give it a healthier, younger glow. Hydra Vital Hyaluronic Acid Facial Spray is a refreshing and stimulating facial spray made from the natural extract of roses and Hyaluronan. Regular use will boost the benefits you get from your regular moisturizers and night creams. Even when using make-up, your skin will look fresher and healthier. For male and female athletes, Hydra Vital Hyaluronic Acid Facial Spray will refresh and cleanse after exercising. Hold bottle 8 inches from face when spraying. After daytime cleansing and moisturising, mist face, pat-in, mist again after make-up is applied (this will help set your make-up and help it to last longer). At night, mist before night cream is applied (because hydrated skin aids absorption).